Since putting part of my family tree online, I've been hoping to be found by more distant relatives who Google their way to my site. No luck so far, but June just hit the jackpot. I put all of Alex's grandparents on the tree, so June's late dad is there, ready to be found. May I ask if your GRANDFATHER's name was AUGUST MAXMILLAN WEDESWEILER, born 1873 and died 4 September 1948 in L.A.? His parents may have been PHILLIP GEORG JAKOB WEDESWEILER, born 23 July 1850 and married to HENRIETTE PHILLIPINE BECKER. If so we would be related, distant though it may be. Phillip's parents were JACOB WEDESWEILER & MARIA CORNELIA FISCHER, and Jacobs's parents were BERNARD (or BERULIARD) JACOB WEDESWEILER and SUSANNE DOTZHEIMER, all from around the area of Winkel, Hessen-Nassau, Prussia. Very cool, if the "His parents may have been" part pans out. Looks like June will have one line tracked back before 1800. Today I learned a lot about setting up a database of books. We need that for the JCS warehouse of textbooks as well as Dori's library at the learning center. Although Ted has a brigade of teenagers ready to start inventorying several thousand textbooks next week, I knew that typing in all those titles and publishers would be a crushing chore. So I jumped to Google looking for ISBN and lookup. First thing I learned is that a few people are using ISBN lookup as a way to learn how to use SOAP to develop web services. http://www.lazarev.com/SOAP/isbn.asp, for example, will give you back the title and author when you type the ISBN into a form. I also learned about the structure of ISBNs. The last digit (the 9 in 0-14-008948-9, for instance) is a check to make sure the rest of it is valid. One FAQ page by a German said that ISBN is on the way out, to be superceded by EAN in which the E stands for European. You can turn an ISBN into an EAN by putting 978 in front of it and changing the check digit. I struck gold a short time later when I found Readerware, a simple data base for books. What makes it unique is that you can type in an ISBN and the software will go to Amazon, Borders, the Library of Congress and elsewhere and find what it can to fill in all the fields. It even looks for thumbnail pictures of the covers! Even cooler, you can use a bar code reader with it. To test it out, I grabbed a bunch of books from the shelves in our den. I was amazed to see how many we have that predate the ISBN era (around 1968) but for those that had it, the software worked like a champ. We could scan in a dozen bar codes in a minute or so and then turn it loose looking for data. Two minutes later, the fields were full and we could create web page reports complete with cover images. This is going to save a lot of man/woman-hours. And the software costs only $50! It's written in Java and runs on OSX as well as Windows. Finding this and figuring it out made this a productive day. I've redeemed myself for these last few lazy days. Another slow post-roadtrip-recovery day spent surfing and snoozing. Alex stayed overnight at Michael's so the every-three-hours question "Are you hungry?" was missing as an organizing force. J & I had a tasty lunch at riceJones. With luck tomorrow I'll actually accomplish something. Drove up to the new book warehouse for Julian Charter School in Temecula with three Linksys wireless routers and a trunk full of PC wireless cards. Got the warehouse plugged in and dropped the rest off at the learning center. Should make it easier to do training there and when Alex is stuck killing time while J works he at least will be able to get things done and have less to gripe about. I didn't put a password on the access point, at least for now. I wonder how long it will be before the warehouse gets warchalked? James Goldsborough got it exactly right on the op-ed page in this morning's San Diego paper. Referring to Bush's big Middle East speech, he says "George W. Bush labored for weeks on his Middle East plan and produced a mouse, a "wee, sleekit, cow'rin, tim'rous beastie" that is an insult to America's influence, power and intelligence." "The energy industry writes Bush's energy plan; the auto industry and Spencer Abraham pull us out of the Kyoto treaty on global warming; Florida's Cuban-Americans get a tougher Castro embargo; brother Jeb gets an offshore Florida oil drilling ban; the rust belt gets steel tariffs and farm belt gets record subsidies, wrecking hopes of a new new round of tariff reductions; the defense industry gets a missile defense system when any arms expert will tell you the last thing a terrorist needs or wants is a missile." "Next comes a Middle East speech - billed as a "plan" - that has not one new idea in it. Dump democratically elected leader Yasser Arafat, says Bush, because Palestine needs democratically elected leaders. Say what? Stop terrorism, says Bush, and Israel will lead you to the promised land." Little by little, I hope people are beginning to see the need for a change in our own elected leadership. Aunt June's funeral was at 11 in San Marino and though we had good intentions of leaving San Diego at 9, it didn't happen that way. June says she's always punctual when it's just her going places but all the overhead of getting me, her Mom, and a groggy adolescent out the door led us to miss the service. We did get there in time for the gathering at Aunt June's house. A nice celebration of a long life. She was loved by lots of people over the years. It's nice not to have to rush to the airport for a change. I decided to cruise up the Naugatuck Valley to Torrington, go on to back roads and head for Hartford. Passed through Unionville, which looks like a nice little town, and Farmington again. I'd never seen Mark Twain's house before, and I'm glad I took the time to stop. He had it built to impress his publishers and to create the glamour that made him the first modern celebrity. Twain lived next door to Harriet Beecher Stowe, which seems pretty amazing. I've been through living history spots and historical tours by the boatload and I've decided that the single most important ingredient for their success is the guide. The man who led this tour clearly felt a connection with Twain. He even came close to choking up a bit when describing how the Twain's life unravelled slowly as he lost his wife and two daughters at an early age. That made the house come alive for me. The museum has been working on restoring the house and recapturing the original furniture since 1929 and they've done a great job. Definitely worth the stop. Next time I'll check out the Stowe house and the Museum of Connecticut History nearby. Spent the morning finally pushing the Design Patterns stuff to the next level and revising the old flowchart of WebQuest design. The new flowchart is simpler. I hope it makes things easier for people. Drove to Farmington to do a 2-hour workshop and a keynote for the Connecticut Association of Independent Schools (CAIS) Summer Technology Conference held at Miss Porter's School for girls. Great group of private school teachers. They raised good questions and seemed to really get it. Now I can relax. A day of aimless touring tomorrow and then home for a few weeks. I spent the morning driving around Waterbury, comparing my fading memories with the inevitable changes. Went past my grandmother's house (now abandoned), my Boy Scout camp, and walked through downtown. They've torn down most of East Main Street and are putting up a new branch of UConn and a performing arts magnet school. It's fun carrying around knowledge of the buildings of my youth and the buildings that I've learned from postcard collecting were there a century ago and comparing it with the present. It's like walking through three eras at once. The apartment building I grew up in was levelled twenty years ago to make way for an overpass over I-84. The last time I was here, the spot was a neglected tangle of weeds and trash between the overpass and the new Brass Mills Center Mall. According to today's paper, the new mayor asked St. Mary's Hospital to take some responsibility for it, and now it's been cleaned up and turned into Waterbury Manufacturers Park. There's a plaque on a millstone that used to be at the foot of the flagpole across the street from my bedroom window. With typical adolescent obliviousness, I don't think I ever read it. Now the millstone is back in this new park. I didn't know that this little patch of dirt went back all the way to 1680. Maybe someday they'll add another plaque that says "The Father of WebQuests grew up in a delapidated building near this spot". As I stood in line to board my plane early this morning, a familiar face crossed directly in front of me on his way to Starbucks: Sam Waterston of Law and Order. Being used to being stared at, he studiously avoided eye contact. He had that same world-weary look he has in the series, yet here it was overlaid with a tan and a hint of relaxation. You can't look like a New Yorker in San Diego for long. From Kuro5hin came the pointer to The Web-Safe Palette Initiative which is collecting nominations for what to call those 216 colors we see everywhere. You can either support the names already suggested or add your own. Over time, I guess, the site will democratically arrive at the best labels. This has me flashing back to 8th grade when my friend George Snyder and I hooked up three flashlights to three rheostats and put red, green and blue filters on the lights. We wanted to be able to create any color possible and I think we had visions of discovering new colors that no one had ever named. Like a lot of our 8th grade projects, I think this one fizzled out long before it got to the Nobel Prize stage. Today on the CNN page, Americans Pick Up Books -- But Are They Reading Them? describes the rise of book clubs on TV and an apparent increase in the number of books people are purchasing though not necessarily finishing. Among the newly avid readers is George W. Bush. "The most surprising convert to the ranks of the highbrow is Bush, who has evolved from calling the Greeks "Grecians" to reading the Greeks himself. An official recently told reporters that Bush's influences included Aristotle's "Nicomachean Ethics," along with Alexis de Tocqueville, Adam Smith and Cicero." Yeah, right. Not unless there's a Classic Comics version. Just got the phone call that Aunt June slipped away this morning. She's not really my wife's aunt, but was so close to the family that June was named after her. She always knew where to get the coolest, classiest gifts, both for June as she grew up and later for Alex. June's best childhood memories seem to all involve going places with Aunt June. June's Mom and Aunt June have a friendship that goes back to third grade, so she'll be feeling the loss more than any of us. Of the 14 who attended our wedding in 1985, 3 are gone already. A drowsy day at home decompressing after a week on the road. I found myself trawling from blog to blog more widely than I usually have time for. Made a few interesting new discoveries. The Psychoceramics list is one. I can already tell that I'm going to have fun with the links from this list. I started this blog on May 19 and haven't missed a day since. Is it worth reading? Probably only to me. But I like the fact that I'm capturing a stretch of life before I forget the details and that I'm loosening up my stiff writing muscles. Haven't found my voice yet, but it's still early. She's doing nice job of tying WebQuests back to its historical roots: Socrates, John Dewey, and Jerome Bruner. From the WNET site she called up a bit of audio from Arthur Costa (which is a good idea I should emulate). She's comparing the way we learned about things like the Civil War in the bad old pre-constructivist days. In contrast, she showed a couple of Vietmam WebQuests. For future directions, she gave Philip's WIP site a plug as well as yesterday's 3DWQ presentation. Good session overall. About 300 here. Onadime takes music or other sounds as inputs and turns them into colorful animations. Where was this in the 60s when I needed it? Seems cool but pricey at $199. Kar2ouche is like Storybook Weaver brought up to date. It lets you restage a play anyway you like (it comes with load of Shakespeare) or create and enact a storyboard from scratch. Some examples: Romeo & Juliet, King Tut as interpreted by an 8 year old. Very cool. Vantage Learning showed their automated essay scoring system. Looked like just the thing for Julian Charter School to look into. Think.com is owned by Oracle and provides free web space, student e-mail, templates and community for schools. Could be a good home for WebQuests, as long as the teacher's school is a member. They don't let you participate as an individual. I've been playing phone tag with someone from this since April. Time to chat with her and see if there's some kind of partnership that makes sense. Right now they're showing a preview of version 3.0 which has some interface tweaks. One cool thing: kids can create an icon to represent themselve using a kind of Mr. Potatohead model. That allows them to personalize it without putting photos up. This, too, is something that we might want to look at for Julian Charter School. After seeing Chris Dede's presentation about Multi-user Virtual Environments for Learning this morning, I decided to add one more slide to my presentation. I had just checked my mail on the PowerBook and put it on the bed, and had the Compaq on my lap while doing a final upload of the slides. As I started to untangle the two sets of power cords, the PowerBook started to slide off the bed. Naturally I lunged towards it and in doing so I turned my lap into a ski slope for the Compaq to slalom down. Time stopped. I can't say that my entire life flashed before me, but for a fleeting millisecond I remembered those values clarification exercises we did in the 70s: "There's room in the lifeboat for only one more person: your son or your wife?". As I watched both computers heading for the floor, I had to choose. It seems as though the wires that attach all the little pixels in the LCD after the first inch or so have become unattached or are hooked up to the wrong pixels. It's a very artistic outcome, actually, in a psycho kind of way. This won't be cheap to fix. Any rational person would have screamed mightily at this point but somehow I kept my serenity. There was nothing more to do, really, than to walk over to the convention center empty handed and try to reconstruct what I had on the computer over there. I was very lucky that the last thing I did was to upload my slides to the WebQuest server, so with half an hour to go, I downloaded that, downloaded and installed Adobe Atmosphere, tested everything and was ready to go ten minutes later. There I stood, using my non-preferred platform, running beta software that has proven to be not totally stable, and doing it on a foreign machine that I hadn't fully tested. No time to worry about it: the place was full. The room seated 500 and there were an additional 50 or so sitting on the floor. All went well. Very well, actually. I guess all those years of transcendental meditation paid off. Spent a relaxed day tweaking my home page and adding a link to this blog for the first time. Had a meeting to discuss my going to Kansas City to do some staff development and then met Philip at the IMax theater to see their Space Station (in 3-D!) and Alamo films. The first was inspiring. Space flight brings out the best in us. The Alamo story was disheartening. Is that what bravery is all about, or was it just a load of macho dumbth? I could probably get run out of Texas for saying that out loud, but on this Father's Day I can't help thinking that getting yourself killed when there was no hope of success and leaving hundreds of widows and orphans behind just wasn't smart. On the very next block was the actual Alamo. My first time seeing it. It was smaller than I imagined. Not the concept, down with the words themselves. This terminology bothered me the instant I heard it for the first time. It has a Nazi ring to it, I thought, and I marveled at how the media were so quick to adopt the phrase without it sticking in their throats. I'm happy to discover that I'm not the only one chafed by this term. Mickey Kaus, from Slate, has written The Trouble with 'Homeland', which points to Rudy's Duty. Plus: Homeland Ain't No American Word by conservative maven Peggy Noonan. Inspired by these articles, Josh Marshall did some online searches to try to find out where this "homeland" thing came from, other than the Third Reich. He traces it back to some recommendations by the National Defense Panel in 1997 and then further back to the conservative thinktank Heritage Foundation in 1985. It's interesting to see how a meme can lie hidden for years and then pop into public awareness overnight. Words carry their own baggage filled with souvenirs from all the other words they've ever spent time with. "Homeland" is a word that's been in lots of bad company and it's time for send it on its way. Domestic Security sounds more American to me. My trepidations about using the beta of Adobe Atmosphere in the WebQuesting in Three Dimensions workshop were realized. While some were able to travel around in 3-D space and interact with each other there, others sat for long minutes staring at a screen that wouldn't refresh. I learned (too late) that some of the worlds have a limit on the number of visitors that can share the world simultaneously. When 10 people went to the Stonehenge world, for example, the first half dozen could see each other. The rest saw Stonehenge but no one was there. It was as though they each had their own private version of the world. Frustrating to them and me. Philip did a great demo of the Builder software and quite a number of the participants did some elaborate things in a short time. The Design Patterns for WebQuests afternoon workshop went considerably better. The design patterns stuff is immediately applicable and those who have taught others about WebQuests in the past could see right away that this approach makes things easier. I went through the evaluations for both sessions and they were not quite as bad as what I sensed. The 3-D WebQuest evals were the worst I've gotten in years, although 80% would still recommend it to their colleagues. The design patterns distribution of attitudes is more like what I'm used to. I won't be doing this 3-D stuff again until the software is stable. There's nothing like carbohydrates to soothe the wounded presenter. We went to an Italian place well away from the Riverwalk. The combined manicotti and cannelloni plate I had did wonders for my soul. Thinking back on it now, I realize that I head for pasta both when I'm feeling down and when I'm out to celebrate. It's my universal road to equilibrium (and I've got a closet full of outgrown belts to prove it). It's close to 2AM here in Central Time and I'm finally done messing with the workshops for tomorrow. In the morning, we'll be doing WebQuesting in Three Dimensions, and in the afternoon, Design Patterns for WebQuests. And in the evening, I'm going to sleep! Spent most of the day in transit from Bismarck to San Antonio for the NECC conference. Another 3 hour layover in Denver during which I decided not to get another haircut. Did some online work there in the Qwest area again and only after paying 3.95 per half hour did I notice that the airport has free wireless access everywhere. It's in the testing phase so at some point there will be a charge, I'm guessing, but what a great service! Met up with Philip at the conference center where we checked out the laptop lab they've set up for us. We got Atmosphere working on most of them but I'm a bit nervous about tomorrow. Never again will I set myself up to do a workshop using beta software! It's incredibly hot and muggy here. Had Mexican food in a place along the Riverwalk and went back to the hotel to tweak the workshop. No time for touring today. I spent all day with 70 teachers of the North Dakota Association for Technology Leadership. Very loose agenda; it was more like a conversation where we meandered among a load of links I has set up ahead of time. I learned about a couple of resources suggested and demoed by the participants: Kartoo, a cool search engine with a graphical interface and IKeepBookmarks, a pretty nice alternative for Backflip. By the end of the day we were all jazzed by the possibility of developing a dozen or more WebQuests about the North Dakota segment of the Lewis and Clark expedition. If Craig Nansen can get some funding, I might be spending a week here next summer with some of this same group cranking out lessons in time for the bicentennial. I'd be delighted to return. Off to San Antonio in the morning. After my presentation this morning, we toured three different sites related to the Lewis and Clark expedition. First stop was the Lewis & Clark Interpretive Center were we were greeted by the director and had a lunch of sloppy joes made with buffalo meat. One of the most impressive exhibits is a recreation of one of the dugout canoes made by the explorers on the trip. The canoes were dug out of a cottonwood tree and were 30 feet long. The men made 6 of these in a 22 day period! Then on to Fort Mandan, a recreation of the place built by the expedition as they wintered here. It was here that Lewis and Clark met Sakakawea, and were helped in surviving the weather by the Mandan people whose village was across the river. Then onward to Sakakawea's home, the Knife River Villages, which were abandoned when the tribes were devastated by smallpox in the 1830s. They've recreated an earth lodge like the dozens that once stood here. Each one housed 10-20 people and they kept their best two horses in there as well. The village was built alongside the Knife River. We walked along trying to imagine what it was like in 1804. The weather couldn't have been better: a cool breeze, deep blue skies filled with great cumulus clouds. A good trip in good company, and a very long day. I was asleep by 9. I was surprised at how pretty it is from the air. As we approached Bismarck you could see large stretches of farmland. It looked like a quilt patched in shades of green and brown and spread out under a deep blue sky. Tomorrow I'm on stage all morning, then off with a group to follow in the footsteps of Lewis and Clark. I had a three hour layover in the Denver airport, which is about the best place I know to be stuck in for that length of time. Qwest has little desk cubicles set up where you can make yourself at home and get broadband access for $3.95 per half hour. I took advantage of the time to catch up on e-mail. But that still left time to spare and since I missed a haircut appointment last week I thought I'd take care of that as well. Bad mistake. My ears haven't been this visible since 1966. I'm hoping that when I wash my hair in the morning that it will expand magically to its former size but I'm not optimistic. The bottom line: never get a haircut in an airport. With a transient clientele, bad barbers survive with impugnity. As the plane neared Denver, you could see the huge clouds of smoke rising from the fire. 90,000 acres, so far. Lots of damaged lungs down there. We picked up Alex from his tennis class at 6PM, just as the partial eclipse was getting as good as it got. Nothing dramatic; colors were a bit washed out (just like they were in the world's worst made for TV movie, The Langoliers). You could see the shape of the moon when the sun was behind our usual June Gloom evening clouds. Alex took the camera outside during dinner and grabbed this shot. I wouldn't be surprised if this picture turns up some day on a UFO site as evidence that the reptilians from Zeta Reticuli have landed. All the Apple boards are abuzz about Apple's 8 new ads showing "real people" who switched from Windows to Mac. Some were quick to point out that all 8 switchers are white. I suppose that's a problem, but what I find a bit disappointing is that the people are still mostly the creative professionals who gravitate towards Mac anyway. There's a graphic artist, a DJ, a programmer, and two writers among them. Is that a realistic sample of Windows users? I hope in future ads they also show a grandma, a plumber and a bus driver. And let the melanin fall where it may. That's a fair question, now that I've been blogging each day for three weeks. Cory Doctorow has written the answer for me. I don't have (or want) the following that his Boing Boing does, so the social reinforcement that he describes doesn't apply here. But for giving yourself a focus, a dumping ground for discoveries, and a vehicle for clarifying your thoughts, blogging is da bomb! As J & I gear up for upgrading the Julian Charter School information system, I keep thinking about useful things to do that would lead to my learning new things. One thing that June asked for awhile back was some way to represent all the JCS students (or various subsets of them) on a map. With that in mind, I found Geocode.com, which offers to turn street addresses into latitude and longitude for you. 2,000 addresses would cost a mere $75. Stopwatch Maps does it for $25 per thousand but has a minimum order of $150. Something to keep in mind if we ever do this for a lot of data. Also found the FFIEC Geocoding System, a government web page that doesn't give you latlong, but does give you information about the census tract of a given address. GeoQwest has a tool to tie spatial and time data together to create a single code. It tells you not only where but when something was. Once the data are geocoded, I could see using PHP to graph the data onto a rectilinear projection map of the three counties and tie it to searches for subsets of the data. Alternatively, we could use Microsoft (ick!) MapPoint on the desktop. What could we do if we geocoded the JCS database? We could organize field trips, play groups, and car pools based on where people live. We could look at the distances between a given teacher and her students and perhaps find ways to reassign students to minimize the driving. From what I've just learned, it seems that one way to calculate that might be what is called a convex hull polygon. That assumes that the area of the smallest polygon that includes all points on the map is a good approximation of the territory you have to cover. By looking at data from the census, we could also do an analysis of what kinds of neighborhoods we're drawing from and maybe correlate it with the curriculum they use and their test results. If that's not immediately useful, I suppose, it could lead to more interesting questi.21; There's a dissertation or two waiting to be carved out of such data. Our first HTH event as insiders was this afternoon: the annual picnic. We sat with a family from Poway whose daughter is thinking about joining the 9th grade there in September. Met some other new families, too, and while they all came from wildly different backgrounds they seemed to be dedicated to the success of their kids. Isn't everyone? Not equally. The event was sort of half-organized. There were supposed to be two tug-of-war competitions but as far as we can tell, the second one never happened. As we arrived, student helpers put a label on our backs with the name of a famous person on it. It was clear to me as a veteran and inflicter of many icebreakers that the idea was to find out whose name you carried on your back by getting people to answer yes-no questions. No one ever explained that, though, or prodded us to talk to strangers to solve the puzzle. I was Picasso; June was Leonardo da Vinci; Alex was Aristotle. Quite a distinguished family, I'd say. We got to talk to a couple of the teachers. They strike me as youngish, devoted to their craft and more willing to make it up as they go than most high school teachers. That could be good. ... sat on the park bench like bookends. Well, we're not that old yet but it was great to see Don Gettner today for the first time in 4 years. We've known each other since 1972 when we worked together at WPI. Everyone around us was questioning and reinventing everything about engineering education. Lots of excitement, lots of experimentation, and a whole lot of drinking. We dined at Lotsa Pasta, where I wolfed down the timpano. This amazing dish was apparently reverse engineered by watching the movie Big Night. It's great to know someone who anchors a memorable part of your life, and to connect with them well enough that you can talk about the here and now and not just rehash the past. I'm lucky to have a half dozen friends like Don that go back 30 or 40 years. It helps keep a life in perspective. Uh oh... just realized something. 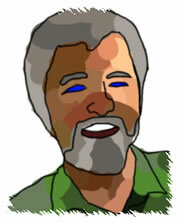 Though he's a luminary in his field, Don has carefully kept himself fairly invisible on the web. Thanks to this blog, though, Google will soon know where he was on the night of June 7th. Old creditors, girlfriends, and subpeona servdar"are now one step closer to tracking you down now, Don. Sorry! I've been waiting for someone to come out with something like this: the Virtix Pan and Scan Filter for iMovie. For $20 you can now create DV movies by scanning in still images and then telling this plug in to pan across the still in any path you want and optionally zoom in. It's the same technique Ken Burns used to bring the Civil War to life using tons of still images. What a great way to transform an old photo album into something more interesting, or to go beyond the usual PowerPoint presentations by kids. I want it. I also want two weeks with nothing else to do. And a pony. Just announced today, MacHeadroom looks as though it might be a bit of fun to play with. You can create interactive QuickTime movies of animated figures that speak whatever text you type in. You can add menus around it to control what it says or link to other web pages. Given that last capability, it seems to me that a given choice can lead to another segment of animated conversation so that you could put together your own My Dinner with Andre. Or a guessing game. Or a FAQ page. It's $150 and that's the only thing stopping me. Attended a demo of Cast:Stream today. I was home and Marcie, Brock, Philip, Gregg, James and others were in various places on campus. I'm very impressed. The interface pulls together a live streaming video (and good audio) of the presenter on the right side, slides and other rich media like Flash on the left, and a chat window down below. Normally I'd feel that the talking head is unimportant relative to the slides and interaction, but I'm ready to moderate that opinion. Having the presenter there with such, well, presence made a big difference. It was a very different experience than walking through a set of web pages. The presenter, I learned later, was just using a PowerBook like the one I use all day and a Canon Elura camcorder like the one I already own. If SDSU buys the server (for $6K) then I could originate a presentation from right here at home. This could be very cool. Had an enjoyable meeting today with the Education Outreach director of the U. S. Holocaust Memorial Museum. Turns out they're planning on a three day event at SDSU next April about teaching about the holocaust and he wants to devote a half day of it to WebQuests. They're planning on 200 pre-service and in-service teachers. The Museum pays for substitutes. Should be an interesting challenge! I'm thinking about simulated diaries, meeting of minds, consensus building.... those are the first designs that come to mind. Given the content, though, I'm going to have to be very careful about not romanticizing or over-simplifying things. I've got 10 months to figure it out. The outreach director is another former Peace Corps vol and a former Californian who then moved to New England and loves it. What does he love? Without prompting, he named the two things I miss the most: the smell of lilacs in May and the cold crisp air (and brilliant foliage) of October. He also appreciates the respect that they have for preserving traditions and old buildings, in contrast with the early 1970's California he left behind which was tearing down orchards and neighborhoods to build freeways and condos everywhere. I think we're better about preservation nowadays. I guess this letter has been online for quite awhile, but today was the first time I saw it. It shows that Bill Gates' aversion to the open source movement has deep roots. Microsoft proves that you can spend enormous amounts of money to develop seriously flawed software. Has the open source side shown that you can create great software with no money spent on development? I'm beginning to think that the answer is 90% of the way to yes. That last 10% has to do with friendly interfaces and documentation accessible to non-propeller heads and I don't know if it will ever happen. Maybe we need an open source batallion of gifted teachers, technical writers, creative writers and artists to finish the job. Caught the tail end of this story on All Things Considered. This is what was at the site of the World Trade Center before the towers went up. The Port Authority took over the area just at the time I was starting to take the train down to NYC on my own as a high school kid. I would have gone crazy wandering through those shops at that time. I suppose the Lafayette Radio store on Canal Street that I did end up going to was a kind of leftover echo of Radio Row. The story was part of a sonic memorial they're putting together gathering sounds from the WTC. From poking around with Google, it appears that the phrase "Radio Row" lives on with a new meaning. It's what they call it when a long line of radio stations sets up a remote broadcasting studio at sports events or political conventions. --- From the great blog Follow Me Here quoting GWBush.com which translated it from Der Spiegel. I loved comic books as a kid. From 1957 to 1963 or so, I'll bet I owned every Superman, Batman, Mystery in Space, Action, and Strange Adventures comic book that came out. Where are they now? As with almost every Boomer, they got thrown out or given away at some point. Unlike some of my vintage, though, I'm not stalking through ebay trying to recapture what I had. Alex has been hard at work for the last few days creating a series of comic strips. He has the same native ability to draw that I had (i.e., almost none) but that won't stop him from creating something that looks recognizable. As a master of Photoshop, he can trace over photos and tweak the results to semi-perfection. He's been trying things out and produced 14 strips so far and he's beginning to find his voice. He asked me how real cartoonists develop their plot lines. Do they plan out a long story arc ahead of time, or do they make it up as they go, or something in between. Here's what I've found so far. Lynn Johnston describes how she plans For Better or Worse. As with a lot of novelists, she creates her characters and they tell her what will happen next. For Simpsons creator Matt Groening, the plots also emerge from the characters, though the characters are whacked out exaggerations of his own family. (uh-oh... I now anticipate appearing in the Alex strips at some point.) The fun comes from the subtle cultural references he decorates it with. Easier to do for a 45 year old than a 14 year old. The Open Source Directory of Online Strips.